This month we feature Tarek Fahmy, a licensed Buzan instructor. 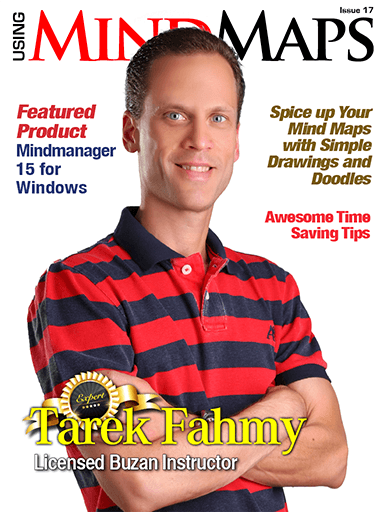 Tarek has a lot of business experience, and it’s very interesting to observe his journey since he discovered Mind Mapping. This can be a lesson for all of us. The benefits of Mind Mapping have no bounds! The growth of mobile devices and smartphones has brought about social, technological and economic changes by putting these devices in nearly everybody’s hands. Even the remotest areas and poorest communities will have access to smartphones in the next few years. The magazine is therefore evolving to take advantage of these changes. Q. Please tell us a little about your background. I was born and raised in Cairo, Egypt. I studied Electrical Engineering and also completed my MBA. A couple of years ago, I got my Masters Degree in History… Mind Maps has helped me a lot in my studying. At Mindjet, we strive to provide revolutionary ways for people to be more innovative, creative, collaborative, and productive. There’s nothing more important to us than making that happen. To that end, MindManager has evolved to take mind mapping way beyond just the brainstorming session. Now it provides one of the most flexible methods for teams and individuals to capture ideas, create strategic plans, and manage everything from meetings to massive projects. We are thrilled to continue that evolution with the new MindManager 15 for Windows, and we hope that you’ll be as excited as we are. Map Parts are one of the most useful time savers built into many mind mapping software programs. From working with other types of personal computer software, you’re probably familiar the many ways you can use templates to save time. Templates define the structure of various types of projects; they provide you with a “paint-by-number” framework for entering text, data, and graphics. A spreadsheet template, for example, saves time creating a profit and loss statement for your business plan. This post is a reprinted translation of an article found on MindMapping.jp, a website managed by Japanese MindMeister Ambassador Yuki Kawazoe. I bet you didn’t know you’re wearing blinders – you know, those leather or plastic screens attached to a horse’s bridle, next to its eyes, that keeps it focused on what’s in front of it and prevents it from seeing what’s next to it and behind it. Not literally, of course. That would be ridiculous. But if you’re like most people, you’re wearing mental blinders that limit your ability to think, create and problem solve effectively. Most adults claim they cannot draw well, so today I’m starting a series that will teach you how to draw simple icons and add them to your mind maps that you draw by hand. Are you waiting? Are you waiting for that perfect moment when everything is just how it’s supposed to be before you take that action, complete that project, pursue that goal, or take that chance? Imagine for a moment waking up tomorrow morning. You get out of bed, brush your teeth, take a shower, get dressed for work and get into your car all ready to drive to the office. But then you wait… and wait… and wait for all the traffic lights to turn green before starting the engine. And so you wait… and wait… and wait… until the work day passes you by.